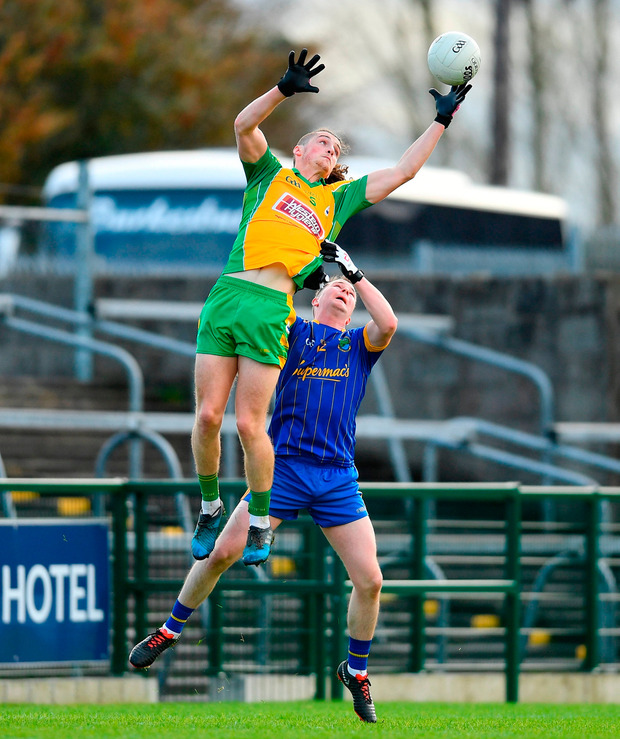 Corofin manager Kevin O'Brien hailed his players' attitude after they blew past Roscommon champions Clann na nGael yesterday to book their place in the Connacht club SFC final. The Galway kingpins had their work done by half-time as they led by 2-10 to 0-3 with Colin Brady and Michael Lundy grabbing the goals. Clann could only manage one point from play in the opening 30 minutes - in-injury time - while they were also reduced to 14 men after Ultan Harney was shown a straight red after a clash with Dylan Wall. Clann also lost captain Donie Shine to a black card in what was a disastrous opening half. Corofin didn't let up in the second half with Man of the Match Jason Leonard grabbing the first of his two goals just 40 seconds after the restart. And O'Brien took the chance to run his bench as the Galway champions ran out convincing winners. And after watching his side come through a fifth game in seven weekends, O'Brien was delighted with his charges. "The last few weeks we have been out five of seven weeks," he said. "We'd a tough county semi-final and then into the final as well so today was a big thing about being mentally ready and the lads deserve huge praise for doing that - after winning a county title last week and celebrating it and were ready again for a game. The lads deserve huge praise." Having been taken to extra-time by the Roscommon champions last year (St Brigid's), O'Brien admitted he expected a stiffer test but believes the sending off of Harney had a big influence on the game. "Coming down to Roscommon you don't expect anything easy. The sending off had a big bearing on the game. We started the game well, which had a big impact, and the conditions, the middle of November, but the pitch was lovely and it really suits our play. "You're always trying to reinvent yourselves and focus on training and try and keep lads interested by playing football and even in training we play football all the time and they respond to that but they deserve a lot of praise for guys who are on the road five six years constantly to be ready to put in a performance again today." MAYO champions Ballintubber defeated Leitrim's Aughawillan 3-11 to 1-8 in their Connacht Club SFC semi-final at Páirc Sean MacDiarmada thanks to second-half goals from sub Jamsie Finnerty (2) and Alan Plunkett. SCORERS - Corofin: J Leonard 2-6 (3f, 1 '45'), M Lundy 1-3, C Brady 1-1, D Canney, D Wall, D Silke, G Sice (1f) 0-2 each, L Silke, R Steede, Martin Farragher, Mike Farragher 0-1 each. Clann na nGael: D Shine 0-2 (2f), E Kenny, C Shine, C Callinan, C Lennon (1f) 0-1 each. COROFIN: B Power; C Silke, K Fitzgerald, L Silke; K Molloy, D McHugh, D Wall; C Brady, R Steede; G Sice, Mike Farragher, J Leonard; Martin Farragher, C Brady, M Lundy. Subs: C Cunningham for Wall (33), D Canny for Brady (35), D Silke for Sice (41), G Burke for L Silke (49), B O'Donovan for Mike Farragher (53), C McGrath for McHugh (55). CLANN na nGAEL: R O'Reilly; D Pettit, S Flynn, R Gavin; D Connaughton, G Pettit, S Pettit; U Harney, C Shine; C McManus, D Shine, E Kenny; D McManus, C Lennon, J Fahy. Subs: M Scally for D McManus (24), C Callinan for Shine (bc, 28), J Dunning for Fahy, D Sumner for C McManus (both HT), D Duff for Gavin (36), N Connaughton for Kenny (49).